Louise Ellerington paints in oils in her Art Studio / Gallery in Clarendon Park, Leicester which is open to the public most Saturdays from 11.30 am to 4.00 pm. 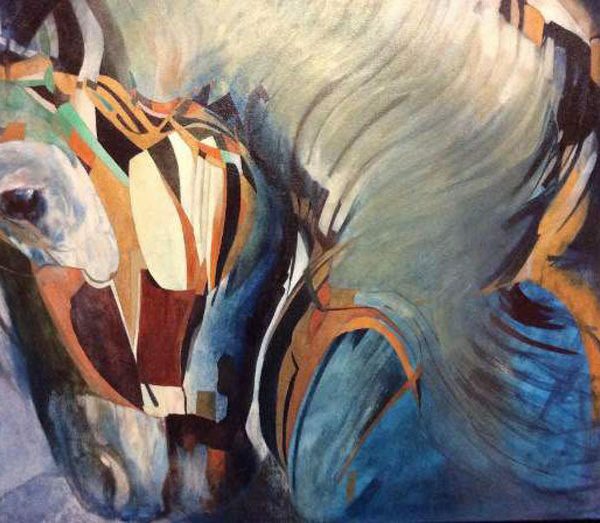 She is recognised by her abstract, symbolic horse paintings , which are for sale at her own gallery and The Cank Street Gallery in St. Martins, Leicester. Louise is a member of Leicester Society of Artists and Leicester Sketch Club where she recently was invited to give a talk about her work. Horses are not the only subjects for Louise’s paintings. She has produced many paintings using local models and friends as subjects for nudes, figurative, mythological and symbolist ideas. Louise has recently completed a portrait of Lady Eliza Manners which now hangs in Belvoir Castle and is now painting The Duchess of Rutland’s portrait. Open Saturday 22nd December at 11.30am, wine and nibbles from 2 pm to 6 pm. All welcome.